Visit to Nice old-town to learn about its history and visit its picturesque places. This stay combines practising the French language with the discovery of different cultural aspects of the country. It is offered to “lovers” of France who, with the experience of age, would not be satisfied with a “standard” course that is often aimed at young university students. Emphasis is put on practising the language, communication and comprehension. The main aim is to help each student to reach the highest possible level of expression and communication in the French language. 9.20 Arrival at the school (2 rue d’Angleterre, 06000 Nice). The alpha.b team will show you to your testing room. 9.30-10.30 Presentation of alpha.b by the class teacher – There is the chance that we will test your level if there are more than 10 participants. We can recommend different places near the school where you can benefit from a discount on showing your alpha.b student card. I have been coming to the Club 50 in alpha.b since several years and it’s always a pleasure to be here. I love going to class in the morning and chat with the other students. At noon, we always have lunch all together. In the afternoon, we have interesting visits, every day is something new to discover. We went to Monaco, Cannes, St Tropez and we had some wine and food tastings. Time flies in alpha.b ! It’s the 11th time I am coming to alpha.b. When I started in 2007, I did not speak French at all. But it has changed so much ever since ! In the morning we have a very fun and nice teacher. 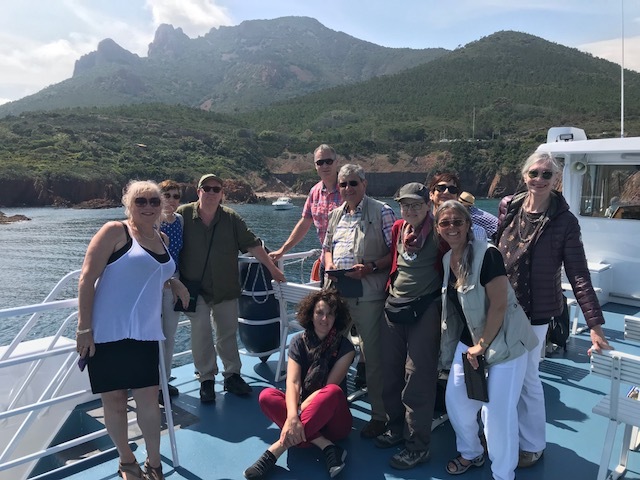 In the afternoon, we have excursions like Monaco, St Tropez, we also visit museums : Chagall, Modern Art, we have tastings : French food, wine and cheese … We really spend 2 unforgettable weeks with the Club 50. We share so many experiences with them that after 2 weeks, they are no longer colleagues, they became friends ! How do the 50+ excursions work? All excursions take place by bus or train with a teacher or the activities leader from the school (there is no accompanying member of staff if the activity is on a Sunday). The classes and activities are exclusively for seniors except for the activity on Saturday which is open to all students. All the activities are done in French by your activities leader. Alpha.b has its own accommodation service and offers you the possibility of staying with a host-family (half-board or without meals), in a 2 or 4 star residence, in a hotel or in a shared apartment. For 50+ participants, your accommodation is willingly selected near the school (less than 1km on foot).